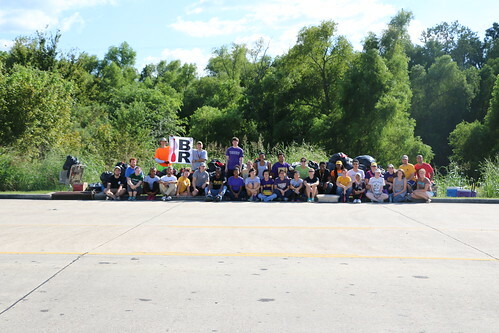 A breezy morning turned into a great day on the Litter Banks of Ward Creek, and with the combined efforts of Volunteer LSU, the Bayou Manchac Group, and PaddleBR, a vast amount of litter was gathered to be sent to a better place. After the work clearing the bridge blockades over the last two Saturdays, everything was ready for the cleanup. Sunday morning dawned, and Jonathan and I made our final preparations and started toward the site. It felt a bit strange to be driving to a waterway without even one boat on top of or towed behind my car, but with the way clear, Jonathan’s pontoon boat would provide all the water transport we’d need (and a bit of a rest sounded nice, too). A few minutes after I arrived with several crates of bags and some gear, along came Jonathan with the rest. Groups of about six went ashore at each spot, each with a crate or bucket of bags and such. The volunteers were amazing. 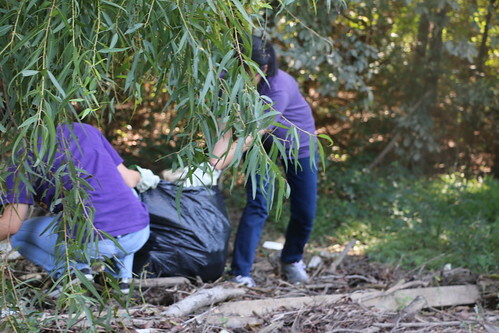 They were picking areas “clean” almost as fast as they could be shuttled around. By the time lunch came around, the gathered litter at the launch point was becoming rather impressive. While keeping a running count, we re-stacked all the litter for pickup. Fifty came and went quite early. Then one hundred passed by with plenty left. And then something terrible happened! We were just shy of 144! Well, at least that was easily corrected. We augmented the stack with just a bit more litter, reaching precisely *one* *gross* *pile*. Yep, 144 bags. A dozen dozens (plus some big stuff). And so, with a nice square number to report, I got down in front of the pile with a nice square banner to match. All told, it was an amazingly productive day. Hats off to the many volunteers who showed up to help. 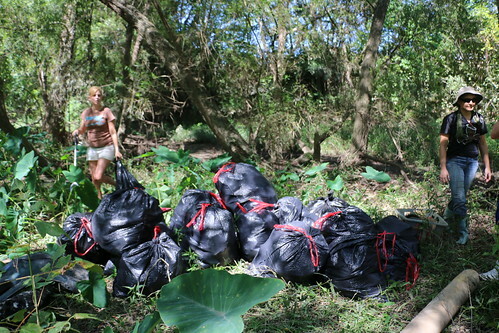 (I’m told we had right around 40 people there for the scheduled four-hour cleanup.) Alas, it was not completely without difficulties, as I had to replace an expensive winch cable and Jonathan damaged a chainsaw Saturday and bent *two* props on his pontoon boat while working to support the cleanup. Hopefully by the next time we do a major work day like this, we’ll have the means to help him out a bit with debris-related expenses instead of merely having our sincere and profuse thanks to offset the cost. 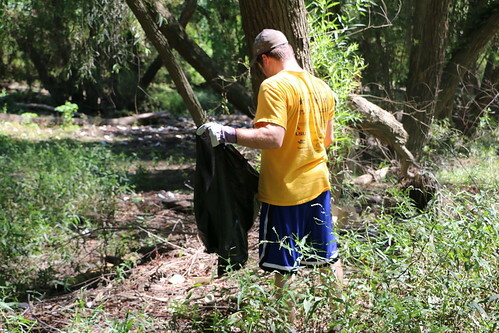 For now, however, thanks again to everyone who came out to help with the cleanup. Without you, it could not have been such a great success. 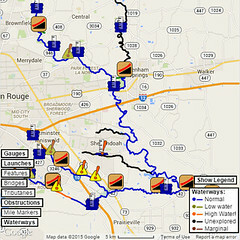 I want to thank you first and foremost for aiming to keep our waterways clean. 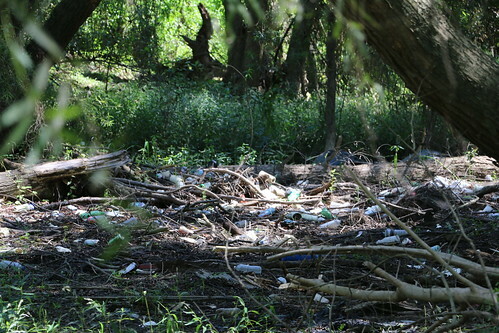 I recently purchased property on Ward Creek and dream of the day my kids can roam the spill banks litter free. My kids and I just so happened to be shopping at PetsSmart on that Sunday and noticed the huge pile of trash bags. I wanted to say hey but didn’t feel comfortable climbing down in the creek with strangers. 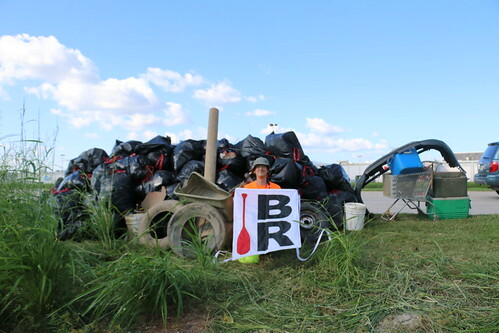 Please keep me informed of upcoming clean up dates as my kids and I would love to float our kayaks and participate in a clean up day to contribute to a cleaner BR back yard.